Movies that gain something with subsequent viewings are a rare commodity in this world. Movies that you like the first time, AND gain something with subsequent viewings are rarer still. 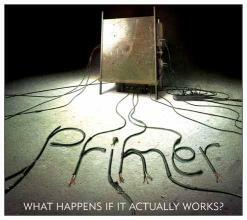 Indeed, Primer is a very rare movie. From first time producer, writer, director, actor, editor, and promoter Shane Carruth comes this complex and engaging cerebral sci-fi idea thriller. What Carruth lacks in budget (the entire movie was made for $7,000, “About the price of a used car”) he more than makes up for with a stellar screenplay that puts his few resources to the best use. Instead of leaning on hollow effects that look more like cheese-whiz than science, the props are grungy boxes and hacked-together electronics – how prototypes are in real life. Along with the grainy look of super 16mm film blown up to 35mm, decisions like this lend an authentic feel to the film that helps ground the viewer as they embark on a journey that will have but a few reference points thereafter. The first time through, I lost my grounding about half the way through. This time, I faired much better, not getting significantly lost until later in the film. Future viewings, I hope, will continue to clarify more what is going on. Do you mind if I syndicate?